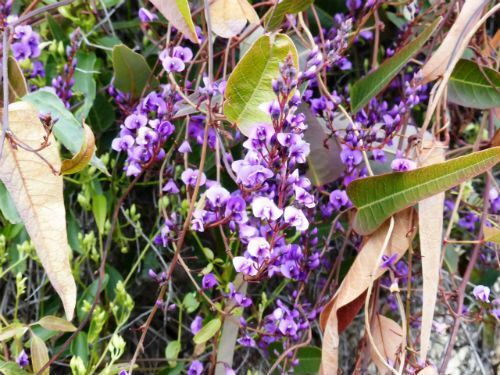 Hardenbergia violacea, Purple Coral Pea or Native Sarsaparilla, is a well known climber with twining stems. The leaves are glossy green, with prominent veins and up to ten centimetres long. The flowers are pea-shaped, up to one centimetre across, purple, and violet and rarely pink or white. They are carried in large clusters from late winter to early spring. Blooms are both profuse and conspicious. They are followed by pods that carry a number of black, hard-coated seeds. H. violacea could be grown as a ground cover if it is denied access to other plants or objects to clamber over. The Purple Coral Pea occurs in all eastern mainland states including Tasmania and South Australia. There are a number of cultivars. “Mini Haha” is an upright form. “Alba” has white flowers. “Happy Wanderer” is a very vigorous climber with purple flowers. If you wish to grow a free-flowering, vigorous climber then “Happy Wanderer” is the “pick of the crop”. Propagate from seed that should be treated with boiling water to soften the seed coat. Cuttings strike readily. Cultivars should be propagated from cuttings to preserve their desirable characteristics.